We were asked by agency Live Nation to come up with suitable merchandise for the bands farewell tour. These were to be premium limited edition commemorative items. We proposed two products we believe captured the spirit of Black Sabbaths heavy rock legacy. We wanted the souvenirs to be timeless in design and feature a heavy metal theme to reflect the bands rock legend status. After brainstorming the problem we concluded our focus should be on the musical instruments that define the band – heavy drums and guitar. 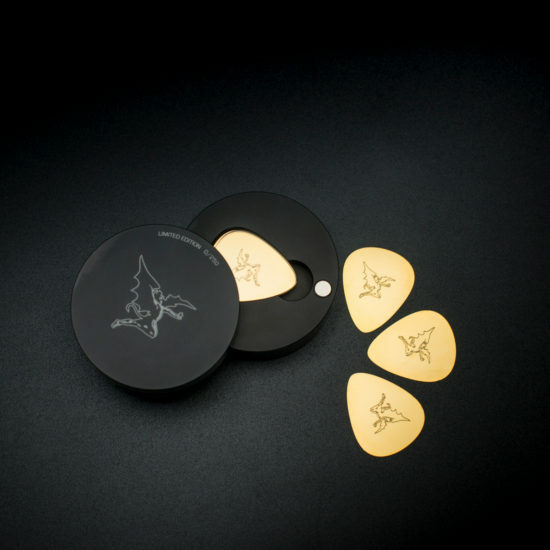 The gold plated plectrums, five in each set, were produced from etched stainless steel and featured the bands ubiquitous demon logo. The plectrums were stylishly presented in a solid machined aluminium casket featuring a pivot lid and a magnetic closure. Each limited edition casket was packed into a smart black cotton bag for safe handling. The edition was limited to just 250 units worldwide. For fans of rock memorabilia, this stunning object is sure to become a treasured collectors piece. We think original Sabbath drummer Bill Ward would have approved. For contractual reasons, Bill was unavailable for the End Tour so we’ll never actually know. Machining a full size drumstick from solid aluminium is no easy thing, particularly if you want a fine tooled surface. 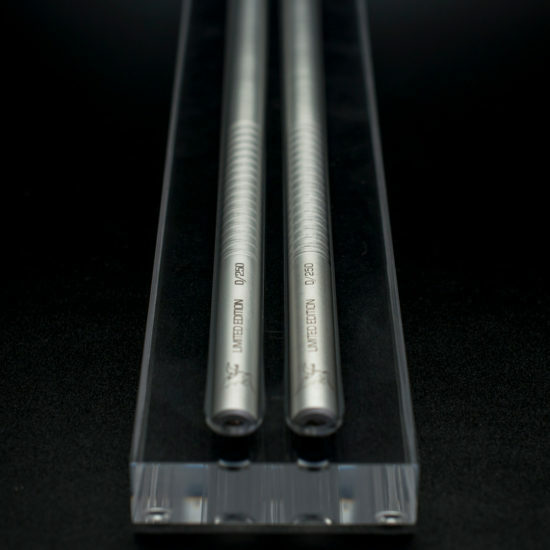 Natural anodising gives the drumsticks a classy finish. We wanted to present each matched pair of limited edition drumsticks in a cool way and opted for a clear plinth machined from solid cast acrylic. A frosted polypropylene sleeve retains the drumsticks in place and completes the look. The result is a truly exceptional piece of merchandise fit for rock legends.